A desire for learning runs deep within Dr. Andriy Shevchuk. Dr. Andriy graduated in 2001 from dental school in Ukraine, his home country, where he subsequently worked as a dentist in a state-of-the-art dental practice. In 2011, he graduated from Loma Linda University School of Dentistry in California. Because of his high standard of doctor-patient relationships and the quality of care he provides, he was recognized as one of their best clinicians and received the prestigious Clinical Achievement Award. During his years at Loma Linda, Dr. Andriy Shevchuk provided dental care to those in need. He joined a mission trip to Ethiopia, Africa as a volunteer. That experience solidified his overall life approach of treating others as you would like to be treated. 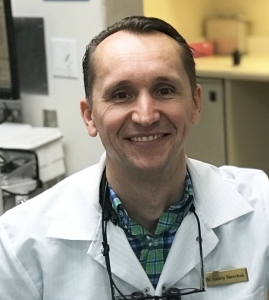 After graduating from Loma Linda, Dr. Andriy spent two years in Los Angeles before moving to Sonoma County in 2013 and starting his own dental practice. He takes continuing education courses whenever possible so that he can stay up-to-date with the latest technologies and offer his patients the best preventive dental care and treatment available. Dr. Andriy takes a minimally invasive approach to dentistry. He believes in saving a patient’s original tooth structure whenever possible, rather than opting to replace it. He develops a customized treatment plan that fits a patient’s schedule and budget and takes into consideration the urgency of any dental issues they may have. Dr. Andriy loves being a dentist because he wants to help his patients have healthy, happy smiles. He also loves challenges and learning new dental techniques. He is a member of the American Dental Association and the California Dental Association.